Do you have a leaking flat roof? A leaky roof can be a very serious problem, but many people do not realize how serious the problem can be. A leaky roof can obviously cause permanent and severe damage to the roof. This can be very expensive. However, there are more dangerous possibilities than that. If a leaky roof is allowed to persist for long enough, it may damage the roof to the point where it collapses. Obviously, this will be extremely expensive. It may even be dangerous depending on how severe the roof collapse is. It is absolutely vital that you get a leaky roof fixed as soon as you notice the leak. But how will the roofers repair your leaking flat roof? Read on to find out. If the leak is fairly minor, it may simply need to be patched. If it can be patched, this will be less expensive and less time-consuming than replacing the entire roof. It is up to the roofers that you bring in to work on the house whether a patch or a replacement is the correct option. However, in the end, it’s your decision. You’d be best off deferring to the judgment of the professionals. 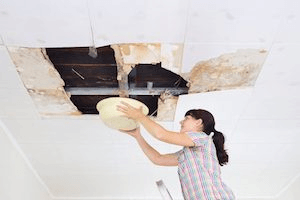 If the leak is quite severe, the roof may need to be replaced. Of course, this will be expensive. However, you should keep in mind that replacing the roof may prevent a collapse, which would be dangerous and even more expensive. As with patching the roof, it is your decision in the end whether or not to the roof is replaced. However, reputable professional roofers will not recommend a roof replacement unless the situation is very serious. You should listen carefully to what they have to say before you make your own decision. One fairly recent development in Roofing technology is sprayed polyurethane foam, also known as SPF. This foam can actually be used to make a roof by itself, or it can be sprayed over an existing roofing material to provide extra protection. If the damage to a roof is more than just a simple leak but less than the damages required for roof replacement, this may be your best option. However, you should keep in mind that not all roofers offer this option. This technology is fairly new, so not all roofers are equipped and trained to perform this kind of repair. To get more info on what to do when your flat roof is leaking, check out our website. You can learn more about what to do in this situation, as well as getting more information about our company and the types of repairs we offer. If you have any questions or concerns, please don’t hesitate to ask. We look forward to hearing from you.